Cruises and ferries, merchant ships, special vessels. Moving people, raw materials, ready products, oil and gas. Built in multiple places, travelling around the globe. Could there be a more demanding context for a welding production? One ship is the sum of its parts. In a multi-site shipbuilding project, solutions which reduce the time needed in equipment set-up, welding documentation or procedure check-up are worth of gold. In modern shipbuilding, every inch matters. Highly competitive global market searches lighter materials and new techniques to meet the profitability expectations at every phase of the project. Knowing the latest possibilities might bring you the deal. Versatile international and national standards, norms and laws pave the way for maritime safety and pollution prevention. Production practices meet the needs of different ship types in local shipyards. Still, the well-being of our seas or the safety of your passengers cannot be compromised in any circumstances. Peace-of-mind is not an illusion. It is the result of the welding excellence. Kemppi is the trusted welding solution partner for shipyards in Asia, South America, Europe, Africa and Australia. Proven in different ship types and in versatile shipbuilding environments, the quality and efficiency of Kemppi is tested multiple times. The world's biggest passenger ship, Allure of the Seas, has more than 2.4 km of weld seams and more than one million kilograms of filler material. Made up of 181 sections, the variety of materials, welding processes, and subcontractors is huge. 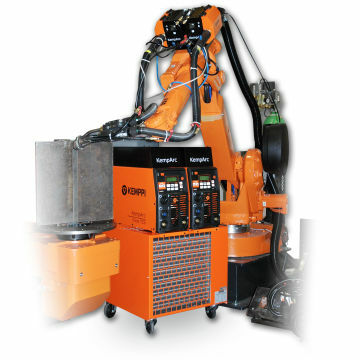 Both manual and automated welding are needed in the production process. In complicated multi-site welding projects, Kemppi increases your productivity with the 360-degree view on your welding production. You save time in the fleet and production management without compromising your customer's safety. Depending on your load, you choose the right type of a merchant ship. Regardless of your load, the reliability of the ship is priceless in meeting your business targets. Kemppi welding management solutions have a built-in quality control and welding guidance. They ensure that each weld holds and is made according the right welding procedure. Each weld is also fully traceable throughout the lifetime of your ship. High-strength steels (HSS) have been under spotlight when searching for new weight reductions in welded structures. Kemppi is pioneering this development in icebreakers, where reduced weld joint volumes and welding times directly increase the profitability of shipbuilding.